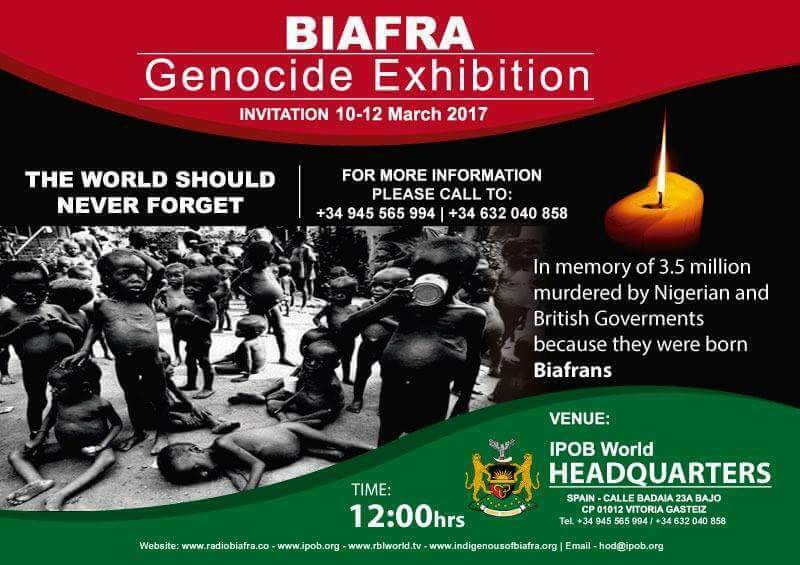 History will be made today 10th March, 2017 as the much publicized Biafran Genocide Exhibition opens in Biafran Embassy in Vitoria, Spain. The exhibition is slated to last for 3 days commencing from 10th March - 12th March, 2017. This will be the first time in history that the atrocities committed against Biafrans by the Nigerian government in collaboration with the British government and other supporters will be in exhibition for the world to see. When contacted by our reporter on why his office is organising this noble initiative, the Head of Directorate of the Indigenous People of Biafra (HOD), Mazi Uchenna Asiegbu had this to say "One of the major reasons that we are putting this exhibition together is to avoid a situation where tomorrow the genocide committed against Biafrans will be denied. We are aware of the ongoing move by the British government as well as the Nigerian government to rewrite history and claim that the genocide never happened. We want to use exhibitions like this to put the genocide against our people in the consciousness of the world especially the media"
The Head of Directorate equally believes that it is in preparation for the denial of the genocide and pogrom against Biafrans that history was removed as a subject of study in Nigerian schools. He however promised that his office will continue to lead initiatives aimed at reminding the world about the genocide against Biafrans and why justice must have to be done in the case of the Biafran genocide as it was done in the case of the Holocaust against our Jewish brothers. When asked about those that are expected at the exhibition, Mazi Uchenna Asiegbu had this to say "The top world media are coming as well as war historians, exhibitors and the general public. He also hinted that foreign friends of Biafra are also invited to the exhibition to come and witness first-hand the atrocities committed against Biafra by the Nigerian government and her British collaborator. Speaking in same vein, during a live broadcast from the venue of the exhibition monitored in Lagos, Nigeria, the deputy leader of the Indigenous People of Biafra, Mazi Uche Mefor who anchored the broadcast stated that a World Conference will equally be held during the 3 day event. At the time of filling this report, Biafrans from all works of life were seen arriving the venue of the exhibition. All the principal officers of the Indigenous People of Biafra are expected to witness the exhibition as well as the conference. The HOD equally informed Biafra writers that plans are in the pipeline to make this exhibition an annual event. Monumental achievement. Kudos to IPOB! When will this exhibition be shown in the U.S.? Please keep us Biafrans in America posted. Good job. We will not forget or forgive as long as we live.